Ireland Bike Tour in northern Ireland. Ireland Bike Tour. Whether you are a cycling enthusiast or complete beginner, looking for ideas for the family, just bike commuting or planning trips with friends there are hidden gems for cyclists of all abilities to explore! In northern Ireland you can pass through undulating glens, stunning coastline and quiet villages. A northern Ireland bicycle packaged tour holiday is ideal because everything is looked after: routes, places of interest and places to stay. Packages offered usually include cycle hire, luggage transfers, maps and specialist accommodation to suit all budgets. Either enjoy getting to know the beautiful countryside of Northern Ireland in the company of other cyclists on a guided trip, or feel free to explore with a tailor-made itinerary on a self guided trip. 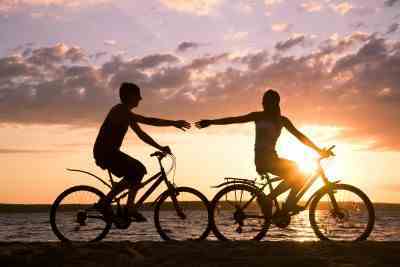 The following providers offer a variety of cycling holidays. There is something for everybody. A great way to explore Belfast, Belfast City Bike Tours in Ireland offer fun, eco-friendly tours of Belfast City with local guides to show you the sites, some of which are only reachable by bike. Clearsky Adventure Centre, Castle Ward Estate, Strangford, Downpatrick, Co. Down, BT30 7LS. The Clearsky Adventure Centre is located at the head of the new multi-purpose trails network in the Castle Ward Estate. With trails to suit all ages and abilities, Clearsky can provide equipment hire for all ages and abilities too. These stunning bike trails twist their way through the spectacular scenery of Castle Ward Estate. There are cycling trails of varying difficulty and distance suitable for young families through to avid mountain bikers, so get pedalling! Iron Donkey tours are aimed at experienced, independent cyclists who are looking for incredible scenery, exhilarating biking and a challenge, along with the opportunity to experience the Northern Irish countryside in the best way possible. The routes, which are unique to the Iron Donkey tours, have been developed over several years by a veteran of the saddle who knows exactly what the serious biker in seek of bicycle exercise is looking for in a tour. Sperrins Cycle Breaks, An Creagán Visitor Centre, An Creggan, Omagh, Co.Tyrone, BT79 9AF. Visitors will relax at An Clachan Self-catering cottages and have free use of mountain bikes throughout their stay. 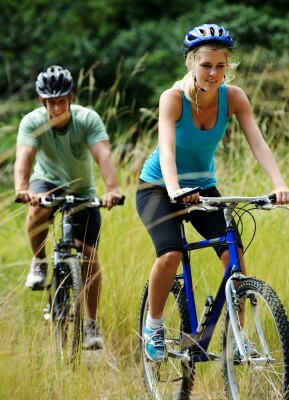 Cycle tour maps are provided to direct visitors to the many archaeological sites in the area. Facilities on site include: eight self-catering cottages, licensed restaurant, craft shop, interpretative exhibition, conference facilities, 5km forest walks and children's play area. Ireland By Bike Ltd, Teelin Rd, Carrick, Co Donegal, Republic of Ireland. These Ireland tours take in the stunning coastal routes of Donegal in Ireland's North West. They are carefully selected biking routes with the needs of the cyclist in mind following mostly quiet back-roads, while still bringing you the best of the amazing landscape, culture and people. They offer a variety of cycle touring options that allow you to select a tour suited to your own level.